A new year has begun and with it comes a refreshing new outlook on things to come. Certainly a spontaneous drop-in at the beauty bar for an overdue pedicure followed by a solitary afternoon at the VIP cinemas helped to add that extra spring in my step. It was indeed a great way to cap off two relaxing weeks off work. But nothing quite prepared me for what I had erroneously anticipated to be a corny musical comedy. You may have heard of it. 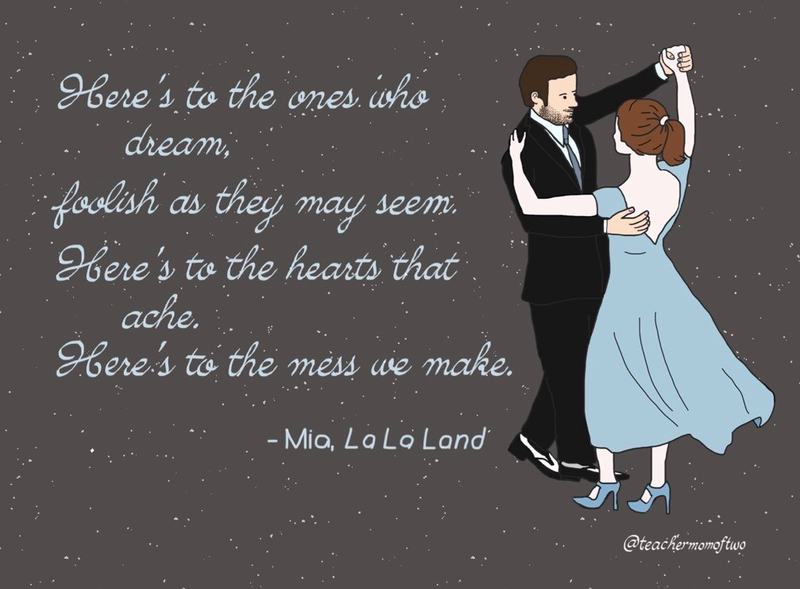 It's called La La Land. While I knew it had received rave reviews in its opening weeks, I chose to see this movie simply because it was the earliest available movie showing that wasn't in 3D. And, you know... the ever charming Ryan Reynolds Gosling just so happens to play the male lead. Nonetheless, I settled into the oversized leather recliner, enjoyed a small meal and let myself get swept away by an onscreen romance unparalleled by any other I had seen before. Before you start to think this is a movie review, it isn't. This is me trying to consolidate a wide range of feelings and hopes and dreams and even regrets brought on by a film that just so happens to have very recently broken the record for the most Golden Globes. Did this whirlwind of emotion have anything to do with the sparkling chemistry between two incredibly talented actors? I don't think so. Their steadfast dedication to perfect multiple arts? Perhaps. A storyline of ill-fated lovers who follow their dreams coupled with original music that is both magical and melancholic? Whatever the case may be, I left the theatre feeling privileged to have witnessed two performers who were clearly living their dreams vicariously through the characters they portrayed. But I also couldn't help but feel a twinge of envy. Am I living my dream? Here's to the ones who dream, foolish as they may be. Here's to the hearts that ache. Which brings me to back to the reason why I am writing this post. I want to kick off the new year with this first post of 2017 in which I toast the many talented and courageous people I have had the privilege to meet throughout my life. To all those who have taken steps, big or small, towards their goal, despite how crazy it may appear to everyone else, to those who have invested their heart and soul in the service of others, to those who create beauty while surrounded by chaos, I raise my glass and salute you. Thank you for being a continual source of inspiration! My dear, you are among those whom I admire for accomplishing your dream and not just once but twice. Cheers to you, my friend! My dream is to have a clutter free house to enjoy.